ISIS fanatics have issued a chilling call for fellow extremists to ‘terrorise’ Jewish communities in the West. Brainwashed supporters were advised to ‘dress up like a Jew’ and conceal weapons under their coats before ‘unleashing the pain of the Muslims’ on their victims. The terrifying call to arms emerged on an ISIS-linked Telegram channel called Lone Mujahid – a chat room where aspiring terrorists are encourage to carry out ‘lone-wolf’-style attacks. The Syrian government has previously denied carrying out chemical attacks. A senior al-Qaeda leader thought to have been killed by a US drone strike in Syria‘s Idlib province is sparking interest among intelligence experts over the manner of his death. Abdullah Muhammad Rajab Abdulrahman, who had been deputy to al-Qaeda leader Ayman al-Zawahiri, was thought to have been killed on Sunday night in a drone attack on a car. 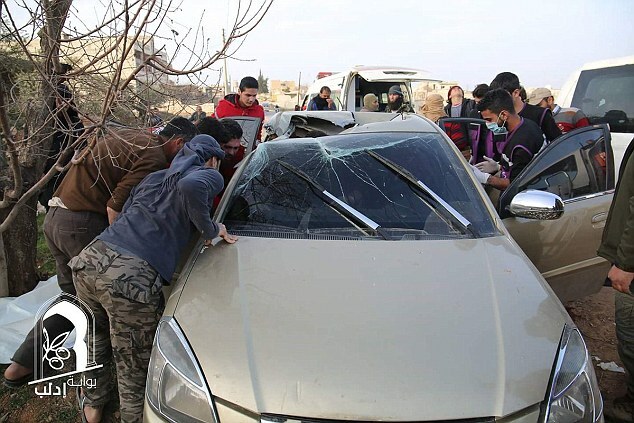 However, unlike previous bombings carried out by drones which usually result in catastrophic damage not to mention leaving the shell of a burned out car, in Sunday’s attack the vehicle appeared relatively unscathed. It could mean that a new type of ultra-accurate drone is being used to ensure killing are carried out with both pinpoint accuracy all while reducing the amount of collateral damage. Could a new type of drone be responsible for the killing of Al-Qaeda’s second in command? The Indian Air Force is in the process of deploying Israeli SPYDER air defence missile system on the western borders that it shares with Pakistan in the coming weeks. The air force aims to boost its readiness to strike down any aerial threat from Pakistan, India Today reported today. The deployment will help in tackling any aircraft, cruise missile, surveillance plane or drone that tries to violate our airspace, a defense official said. The induction process for the country’s air force was delayed more than three years due to lack of availability of Czech manufactured Tatra trucks on which the missiles were to be carried. The SPYDER (Surface-to-air PYthon and DERby) is a low-level, quick reaction missile (LLQRM) to neutralise hostile targets up to 15 km away and at heights between 20 and 9,000 metres. The system provides fast reaction air defence protection against enemy aircraft and unmanned aerial vehicles. Obama administration holdovers and loyalists are waging a leak-driven media campaign against a senior counter-terrorism adviser hand-picked by President Donald Trump, with the aim of undermining the Trump administration’s national security apparatus, according to multiple senior White House officials and sources close to the administration. Sebastian Gorka, a longtime national security expert profiled by senior editor Bill Gertz in today’s Free Beacon, has been the subject of multiple leaks and negative stories portraying him as a bigot as part of a campaign similar to the one that brought down former national security adviser Michael Flynn. Senior White House officials dismissed the media narratives and said Gorka is well liked and respected by Trump’s innermost crowd. Several of these sources would only speak on background because they were not authorized to discuss internal White House workings. They also expressed growing concern about leaks from within the administration that are aimed at undermining Trump’s senior advisers. South Korea’s foreign minister, Yun Byung-se, has warned that the North has “thousands of tons of chemical weapons” across the country and called to suspend Pyongyang from the UN. Yun Byung-se has called for invoking a chemical weapons convention in light of the assassination that killed the half-brother of North Korean leader Kim Jong-un in Malaysia. “North Korea is reported to have not just grams but thousands of tonnes of chemical weapons including VX all over the country…the recent assassination is a wake-up call to all of us to North Korea’s chemical weapons capability and its intent to actually use them,” the minister said as quoted by Reuters. He also warned that within North Korea’s stockpile is VX, the nerve agent which is believed to have killed Kim’s half-brother Kim Jong-nam at Kuala Lumpur International Airport earlier this month. The statement made at a UN disarmament conference in Geneva comes after Seoul signed a land swap deal with retail giant Lotte, which will allow South Korea to host the controversial US THAAD missile system. Both Seoul and Washington say the system is a defensive measure against Pyongyang. Die Welt’s Deniz Yucel, who has both Turkish and German citizenship, has been arrested in Turkey on charges of “terrorism propaganda” and “inciting violence,” according to a court witness. The news has sparked a harsh reaction from Germany. Two weeks ago, Yucel was detained after reporting on emails allegedly from the private account of Turkey’s energy minister, Berat Albayrak, who is also President Erdogan’s son-in-law, which had been released by a leftist hacker collective. The leak has been linked to a huge scandal that began months ago, when WikiLeaks said that the emails proved Albayrak’s connections to Islamic State [IS, formerly ISIS/ISIL] oil trade. The 57,000 emails from 2000-2016 tied Albayrak to staffing and salary questions at Powertrans, a company with a monopoly on providing road and rail logistics for oil being transported from Kurdistan. In 2014-2015, Powertrans was also linked to IS-produced oil coming from Syria. Though there wasn’t enough evidence to prove the allegations, Albayrak denied having any links to Powertrans anyway. 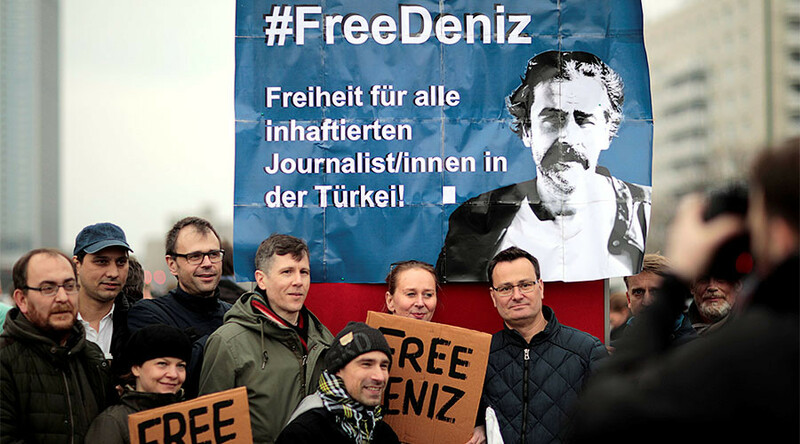 A court witness told Reuters that the correspondent was jailed pending trial on Monday, becoming the first German reporter to be detained since the July coup and the ensuing crackdown on media. South Korean prosecutors charged Samsung Group [SARG.UL] chief Jay Y. Lee with bribery and embezzlement on Tuesday as the top conglomerate announced the dismantling of its corporate strategy office, the latest developments in a graft scandal that has rocked the country. Did China Just Make ALL Stealth Fighters (Think the F-22 and F-35) Obsolete? The F-35 Joint Strike Fighter has been hailed as the ‘most expensive weapon in history’, costing $400bn. However, according to Aviation Week, the plane’s laser targeting system has one slight flaw – it can only target stationary or slow moving objects. ‘Despite being among the most technologically advanced low-observable warplanes on the planet, the Lockheed Martin F-35 has one significant shortcoming,’ it wrote. The jet has gone through dozens of updates to its software, with the Block 3F being the most recent. Google has countered to a “highly effective” phishing scam that in recent months impacted users of its Gmail email service. No longer. Google has responded to the problem with an update to its Chrome browser. In the new version, released earlier this month, the browser’s address bar warns people when they have been served a page that uses the phishing trick. MOSCOW — Russia is moving aggressively on another traditional patron of U.S. arms exports: the United Arab Emirates. Rather than cheap small arms and land-based platforms, Russian companies appear to have identified a market opportunity: relatively cost-effective alternatives to Western fifth-generation fighters. The head of Russia’s largest defense conglomerate Rostec, Sergey Chemezov, told reporters at the IDEX show in Abu Dabi this week that Rostec would partner with the UAE Defense Ministry to develop a light fifth-generation fighter jet based on the MiG-29. Development is slated to begin in 2018, and production should launch seven to eight years after that. Ukraine-run businesses to be seized in Donetsk and Luhansk if blockade does not end, say Russia-backed rebel leaders.Separatists in eastern Ukraine have threatened to take control of Ukraine-run businesses in rebel-held areas if the Kiev government does not end a rail blockade that had halted coal supplies. The ultimatum came on Monday, a month since a group of Ukrainian legislators and army veterans started blocking some rail traffic in eastern regions. The blockade is opposed by the Ukrainian government, as it prevents coal produced in the rebel-held territory from reaching power plants and the steel industry in the rest of the country, whose exports are a keystone of Ukraine’s economy. In a joint statement, leaders of the so-called Donetsk and Luhansk People’s Republics (DNR and LNR) said on Monday the blockade had caused many businesses to suffer in rebel-held areas and that it went against the spirit of the 2015 Minsk peace agreement. They also said they would stop selling coal to Ukraine and send future coal supplies to Russia or elsewhere. Late last year, top cybersecurity investigators from a private firm and Russian intelligence were arrested in dramatic fashion. One was dragged out of a meeting with a bag over his head. All were disappeared. Details were scare at the time, but revelations from a new Reuters report now only complicate what we know. According to a Reuters source, the treason charges are related to accusations made by a Russian businessman named Pavel Vrublevsky seven years ago. In 2010, Vrublevsky, founder of internet payment firm ChronoPay, reported the suspects to authorities. He claimed that they had passed state secrets to American firms including Verisign, a company that specializes in domain name services and internet security, which then turned them over to US intelligence. Reuters reports the accusations were never investigated. A spokesperson from Verisign, the only American firm identified, denied that it had been given any secret information. The company does have an iDefense unit that gathers information on cybercrime and supplies dossiers to US intelligence, but the spokesperson insisted that it does not deal in classified information. “Nothing like the arrangement as described by Pavel Vrublevsky ever took place,” said Kimberly Zenz, a former analyst at Verisign’s iDefense unit. Something big and important must be at the heart of a relationship in which both sides are able to overcome the pain they repeatedly inflict on each other. Russia and Turkey, historically adversaries and newly active allies, are one such case. While the United States is sending conflicting signals about its Syria policy, Russia, Turkey and Iran are negotiating a pragmatic framework of coexistence in the region, which is torn by international and sectarian conflicts. Russia and Turkey in particular seem to have found a way of pursuing larger goals while agreeing to disagree on the many diverging interests that will always keep the two countries apart. The two countries’ mutual history is rough. They clashed incessantly and waged war on each other once every quarter century when they were still empires. Soviet Russia and Kemalist Turkey ended up on opposite sides of the Cold War divide. Irbil, Iraq (CNN) The Iraqi army says it has recaptured a bridge across the Tigris River in west Mosul, where fierce battles are ongoing to oust ISIS from its last bastion in Iraq. While all five bridges linking the government-held eastern Mosul to the western part have been destroyed, the takeover of the fourth bridge will allow Iraqi forces to lay a ramp over the broken part and open a supply route from east. “The Rapid Response Forces of the Iraqi Federal Police completely liberated al-Jawsaq neighborhood and control the fourth bridge… Iraqi flags are now raised on buildings, and heavy casualties were inflicted on ISIS,” Lt. Gen. Abdel Amir Rasheed Yarallah of the Joint Operations Command said Monday. Imports of Iranian crude by Asia’s four main buyers of the oil rose about two-thirds in January from a year ago when levels were lower as Western sanctions on Tehran had only just been lifted. Iran’s top four Asian buyers – China, India, South Korea and Japan – imported 1.64 million barrels per day (bpd) last month, up 67.6 percent on a year earlier, government and ship-tracking data showed. Airbus (AIR.PA) faces tough negotiations on two fronts as it seeks new relief from European governments and engine makers for losses on its troubled A400M military transporter plane. The planemaker called last week for new talks with European governments to ease “heavy penalties” for delays to the troop and armored vehicle carrier, after taking a fresh 1.2 billion euro ($1.3 billion) charge for Europe’s largest defense project. It has also appointed a new program manager for the A400M as part of a broader reshuffle and is set to beef up the management of its military aircraft business with a new deputy, industry sources said. Airbus declined to comment. The 20-billion-euro project has been beset by political wrangling since its inception more than a decade ago. By citing a new ‘crisis’ and calling for ministerial talks, Airbus seems to be repeating tactics that led to a previous 3.5 billion euro bailout in 2010. STEPANAKERT, Artsakh (ArmRadio)—The Azerbaijani launched an offensive toward Artsakh (Nagorno-Karabakh) Republic positions on February 25 using various weaponry in the southeastern (Martuni) and eastern (Akna) directions of the Artsakh/Azerbaijani border, also known as the line of contact, twice at 3am and 4am, the Artsakh Defense Ministry reported. The Artsakh armed forces did not have any casualties, while Azerbaijan lost five servicemen in the neutral zone. “The attempt was a complete failure,” the Ministry said, adding that, as the Azeri side tried to ascribe its actions to the Armenian side. The Singaporean military’s dedicated web access system was breached this month by hackers thought to be hunting for official secrets, the government said on Tuesday. Investigations into the breach of the Ministry of Defence’s “I-net” system – which is detached from computers dealing with classified information – found the personal information of about 850 people had been stolen, the ministry said. One analyst said there was a “high probability” that the hack was state sponsored. The I-net system is air-gapped, meaning that computers linked to it do not have access to a separate system that handles the digital exchange of classified information. A Russian intelligence official will reportedly face indictment for plotting a coup to stop Montenegro from joining NATO by assassinating its prime minister. Eduard Sismakov, an officer with the GRU military service, allegedly ran a network of Serbian and Russian nationalists and paramilitaries who tried to disrupt the Montenegrin election Oct. 16. The plan was to break into the Montenegro Parliament, kill Prime Minister Milo Djukanovic and put pro-Russian parties in power. Milivoje Katnic, Montenegro’s special prosecutor, told The Telegraph that a group of plotters were placed among protestors outside the parliament building as the election results were announced. The group was supposed to force its way inside the building at an appointed sign. Another group, dressed in police uniforms, would then open fire against the protestors “so that citizens would think that the official police are shooting at them.” The eventual goal was to kill Djukanovic inside the building. Singapore-based firm Pan Systems had no connection to Glocom, the North Korean front company that violated United Nations sanctions by selling battlefield radio equipment, claims its managing director, Mr Louis Low. His denial comes after a report by Reuters yesterday, citing a UN report drafted for the Security Council, which said Glocom was operated by the Pyongyang branch of Pan Systems. The report also said the North Korean branch of Pan Systems made use of bank accounts, front companies and agents in China and Malaysia to trade in radio components and accessories. The Army is deploying more than 100 MRAPs to South Korea by the end of February to boost troop protection capabilities as tensions rise on the divided peninsula. SEOUL, South Korea — The Army is sending more than 100 Mine Resistant Ambush Protected vehicles to South Korea to boost troop protection capabilities as tensions rise on the divided peninsula. The decision is a reversal after a 2012 feasibility study found that MRAPs — famous for saving countless lives from roadside bombs in Iraq and Afghanistan — weren’t suitable for maneuver battalions in South Korea. The 8th Army says it began fielding MRAPs and smaller versions known as M-ATVs in late December and was on track to complete the deployment to multiple locations by the end of February. China has secured an international contract for its Wing Loong II strike-capable reconnaissance unmanned aerial vehicle (UAV), marking another milestone in the country’s bid to become a major military exporter. China’s state-run Xinhua news agency reported on 28 February said the deal represented the “biggest overseas purchase order in the history of Chinese [UAV] foreign military sales”. The identity of the customer and the size and value of the contract were not disclosed. China conducted a total of 63 seabed surveys inside Japan’s exclusive economic zone (EEZ) in the East China Sea and elsewhere without consent over the five years from 2012 to 2016, according to a survey by the Japan Coast Guard. China has made an application to the U.N. Commission on the Limits of the Continental Shelf (CLCS, see below) for extending its continental shelf to areas inside Japan’s EEZ. China apparently has been increasing its research activities aiming to expand its maritime interests. A country’s territorial waters extend 12 nautical miles (about 22 kilometers) offshore. An EEZ refers to the area of sea beyond that, extending up to 200 nautical miles (about 370 kilometers) offshore. Foreign ships can freely pass through EEZs. A Tokyo Electron plant in Miyagi Prefecture is seen here. Cutting-edge semiconductors are among the technologies that the Japanese government seeks to protect. TOKYO — Japan looks to bolster regulations on the export of advanced technology that could be diverted to military use, seeking to keep sensitive information and materials away from other countries and help domestic companies retain their edge. Government permission is required to export cutting-edge materials or technology such as carbon fiber — which can be used in aircraft and centrifuges — and power-amplifying semiconductors. Current law provides for penalties of 5 million yen to 10 million yen ($44,300 to $88,600) for both individuals and companies. One proposed revision imposes fines of up to 30 million yen on individuals who leak technology related to weapons of mass destruction, such as nuclear weaponry, and 20 million yen for leaks related to conventional arms such as handguns or land mines. The caps for businesses would rise to 1 billion yen and 700 million yen, respectively. MONDAY, FEB. 27, 2017, 4:47 P.M.
WASHINGTON – Counterfeit goods, software piracy and the theft of trade secrets cost the American economy as much as $600 billion a year, a private watchdog says. In a report out Monday, the Commission on the Theft of American Intellectual Property says the annual losses range from about $225 billion to $600 billion. The theft of trade secrets alone costs the United States between $180 billion and $540 billion annually. Counterfeit goods cost the United States $29 billion to $41 billion annual; pirated software costs an additional $18 billion a year. The findings echo those of the Office of the Director of National Intelligence, which in 2015 pegged the annual cost of economic espionage by computer hacking at $400 billion. The commission labels China the world’s No. 1 culprit. Including Hong Kong, China accounts for 87 percent of counterfeit goods seized entering the United States. The report says the Chinese government encourages intellectual property theft.